The Ink2image range of compatible cartridges for Noritsu Dry Lab printers provide a simple way to enjoy substantial savings on printing costs. 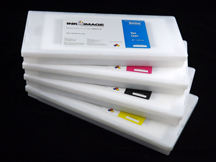 Priced at over 40% lower than Noritsu originals, Ink2image cartridges are filled with the i2i Absolute Match color matched dye inks so new color profiles are not required. Users can happily continue printing with current color and driver settings. Because the Absolute Match inks used are freely mixable with the Noritsu original inks, no printer flushing is required before use, and existing inventories of original cartridges can be used up along side Ink2image cartridges. All Ink2image compatible cartridges are fitted with ink level monitoring chips and are used just like original cartridges. Simply plug them in and print. The inks used in our cartridges are of the highest quality and all have been exhaustively tested for printer reliability and non-clogging performance. All inks have also undergone direct fade testing alongside the equivalent original inks, and match or exceed the same fade resistance in all cases. Absolute Inkjet also supplies excellent paper for Inkjet drylabs. Click on the links below for more information.